On the final day of Rally Finland 2003 Richard Burns, Carlos Sainz and Petter Solberg literally started the event all over again, only half a second separating the three after two days of driving. Eventually the final day was a great battle between Burns and Solberg – which the Norwegian took to his benefit and eventually went on to win the World Championship title. RALLIRINKI called Solberg and asked how he remembers it. The World Rallying champion of 2003 Petter Solberg answers his phone from his home garage. He’s between races in World Rallycross, busy running his team, but still interested in taking the time to talk about past times. “I have the 2002 car in here at our workshop right now “, he interrupts enthusiastically. Ending the previous season on a high note, do you remember what goals you had set for the 2003 season? The season 2002 was very much dominated by Peugeot and Marcus Grönholm. For the 2003 season Citroën came with full force and Ford was having their new car introduced in the middle of the season. How confident you were on your own and your team’s chances against the other teams? At the that time you all were doing it big. You had a kind of nightmare start to the 2003 season. After the first three events you had only 3 points with two zero scores. By the mid-season and Rally Finland, you were 5th in the championship 13 points adrift of Burns who was in the championship lead. In an interview for Rally XS magazine at the time, you mentioned you were still aiming for the championship, even if that far behind in the points. Did you really believe in that? The second half of the season from the victory in Cyprus and the 2nd place in Finland meant you had found your pace and consistency. As I know the sport and the drivers, it’s difficult for a top driver to do that reset and take the step back in the middle of the season. How did you succeed in that? We are talking about Tommi Mäkinen? Let’s get into Rally Finland 2003. Your teammate Mäkinen said in the pre-event interviews that Rally Finland was not in Subaru’s high priority list that year which meant you had the pre-event tests only the weekend before, two days for both of you. How do you remember your preparations being that year? Come the rally, it was eventually a two horse race between Märtin and Grönholm. On the first leg you had your small problems, but still dropping 50 seconds down in Finland is a lot. Halfway through the rally your event as well as Tommi’s was characterized by many issues with the mousse system when the Pirelli tyres punctured. You also had some stages with hard vibrations from the tyres. A classic case is the second run through the Ouninpohja stage. You came to the stage end very frustrated saying to the stage end interviewer “having had the biggest mousse problem in your career”. That poor fellow thought you meant the king of the forest, a moose, and asked which side of the road it stood. Do you remember that moment? There was a lot of humor involved between the drivers at the time. During the days you fought tooth and nail in the stages, but coming to Saturday’s end of the day press conference, you were like a bunch of school boys. On that press conference you were asked about the fans as Märtin’s Estonian fans and your Norwegian fans were very visible that year. You said that the Norwegian fans are still in the stages following the event, then Burns took the microphone and said “they’re still in the stages because they’re so drunk”. On Sunday, the rally started all over again for you, Burns and Sainz as you started the last leg within half a second. On Saturday evening you downplayed your chances to take the 2nd place from Burns. Did you really think that? That’s exactly what you did on the Sunday stages. The battle between you and Burns briefly stole the show from Märtin’s victory. The last stage was the Mökkiperä with big jumps in the beginning. You went over them flat out. On Subaru team’s pre-event press release, there’s an interview with you how you’ve been playing with your son Oliver, 21 months at the time, buying him a kickbike in “metallic blue, naturally” and the press release also jokes about that Oliver might become a rally driver in the future. 15 years later that is now happening. When did you realize your son is going to follow your footsteps in motorsport? If we look at Rally Finland 2003’s WRC entries, there’s Harri Rovanperä whose son Kalle Rovanperä is starting Rally Finland this year in an R5 car and same goes for Sebastian Lindholm’s son Emil Lindholm. There are other examples of the next generation drivers too. The next generation from early 2000’s children is now coming. There is something in this sport that takes it from fathers to sons. “It has to come from themselves. It’s hard work getting all the sponsorship. It’s not only about driving. My son would not drive if he would not find the sponsor. You will have to learn it properly. I would not just put money into it. It’s not good to go too quickly forward. Or if you go too quickly, you should take the step back. Another example is Andreas Mikkelsen, but he took the step back. “You are absolutely right. He still isn’t a World Champion and has a lot to learn, but he’s on the right way. One final question. 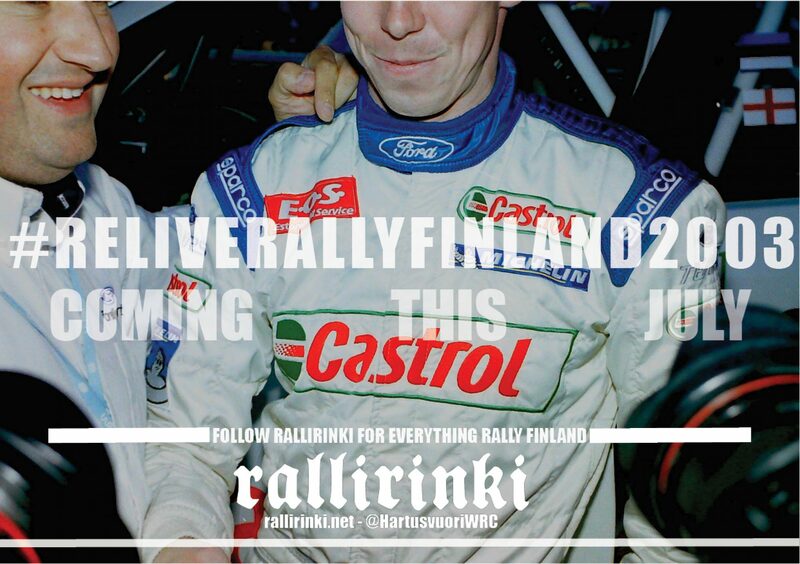 What is your current relationship with Rally Finland? “I haven’t been to the rally lately. I have my RX driving and a lot of work to do with my own team with Volkswagen cars. If I would only drive the car, then it would be fine, but I ran the whole team with my wife and we have 40 people working for us. “I follow every rally with All Live when I have the possibility. I also follow times and also try to analyze why some drivers are losing time and other are so fast. I like the technical side a lot. I hope one year you would have the time to visit the event again or even take part in it. You know retired Finnish drivers have this habit of doing it one more time. Or maybe for you that rally would be Rally Sweden? I think I just got my headline. Here ends our call. With a joker face or a poker face, maybe one day we will learn. There’s only one Petter Solberg.